We love spuds, so there was no question that our vegie patch plan would include spuds and lots of them. In anticipation of great mounds of spuds, I eagerly bought a "gourmet combo" of seed potatoes. 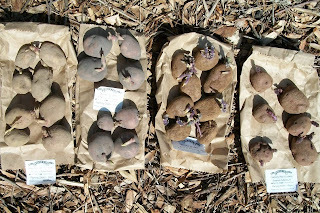 The pack included six varieties, each with around 8 tubers. The Kipflers and the Nicolas went to Dad as we was keen to give those a go. That left us with the remaining 4 varieties (Desiree, Kind Edward, Royal Blue, and Cranberry Red), or 32 tubers. Now here is where doing the maths before getting too carried away would have helped. According to a variety of sources, our seed tubers needed to be planted in rows 40-80cm apart with 25-40cm between the spuds along the rows. The packets the seed tubers came in recommended 40cm x 40cm. Now 32 tubers at those spacings meant we were pretty much looking at not only an entire bed, but a bed larger than any of our existing ones. Since we've been thinking about extending the vegie patch down the hill and adding an extra bed anyway, we figured that a no-dig potato patch would be a great way to start. Because gardening in our backyard involves lab-proofing, we needed to figure out what we would use as a barrier around the new patch. 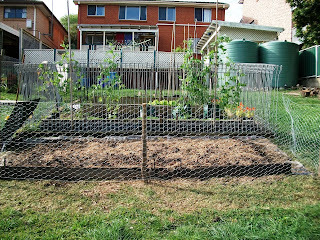 The long term plan is that we would use the 2 pool fence panels from the old vegie patch to extend the new vegie patch. However, we're not ready to move those yet so we needed an interim measure. We decided to go with chicken wire. The no-dig method involves layers of straw, manure, and compost, plus a bit of blood & bone. We already had a good amount of compost and some blood & bone, but needed to buy straw and manure. A trip to Bunnings later and we had 8 bags of pulverised cow manure, 3 bales of sugar cane mulch, and a 10m roll of chicken wire. A no-dig patch, as the name suggests, involves no digging. Given our horrible heavy clay soil that is full of rocks, we're a fans of no digging. However, we did need to mow the grass and weeds down, which also served to mark out the area. While the patch will mostly be a "mound", due to the slope of our yard, we needed something along the lower edge to stop the whole mound slowly sliding down the hill. We re-used some edging from one of the old vegie beds. To try and keep the kikuyu and weeds at bay around the edges of the bed, we laid down wet newspaper. Unfortunately we didn't have enough to cover all the bits we wanted to, so we will have to add to it later. The fence was the next thing to go up. The Cunning Plans Dept made some stakes out of branches from the old tea tree and we stretched the chicken wire around the patch, leaving a "gate" at one end. Next was the layering. Normally with a no-dig patch, you could put the seed potatoes straight on the ground and pile the layers on top. As our ground is hard clay, we figured we'd give our spuds could use a layer between them and the soil. First we sprinkled a generous amount of gypsum over the ground, which will help break up the clay. Next was a layer of one bale of sugar cane mulch and 4 bags of cow manure mixed up. The seed potatoes were laid out on this layer, which was ~6-7cm deep. Due to a slight glitch in my mathematical abilities, we had to adjust our layout a bit, but ended up with 3 rows with 9 spuds in each row, with spacing ~40cm x 25cm. I did at least remember to make a note of what we planted where in my garden diary. This, you will note, is only 27 spuds. As it turned out, we only had 30 tubers and I'd previously bought 3 "grow bags", so the leftover 3 spuds went in those. We then continued with the layers. Sugar cane mulch, then the rest of the cow manure, blood & bone, then more sugar cane mulch, then a layer of compost, and finally a bit more sugar mulch on top. We'd been progressively watering in the heap as we went. Fortunately, the weather decided to be helpful and just as we finished the final layer, the skies opened and we got a brief downpour. I still gave it a bit of Seasol after the rain for good measure. The final step was to stake the bottom edge of the chicken wire and rig up a bit of plywood (re-cycled from the old dog kennel) as a gate. Voila! One potato patch. We didn't really have an idea of how much manure and straw we would need, but as it turned out we needed more than we got. Ideally, we would have liked to have had the heap at least 30cm deep, but it's probably more around 20-25cm deep. As we will need to keep adding to the heap as the potatoes poke up through the top, we're going to need to get much more straw and manure. Total depth will need to be 50-60cm. That's a total of ~$230. If we have good yields, that will be ~1kg per plant, so 30kg of spuds. Current spud prices are ~$2-3/kg for bog standard spuds, and ~$4-5 for "gourmet" varieties, so we could grow maybe $90-110 worth of spuds. However, much of the costs are because we're starting a bed from scratch, which we won't need to do in future seasons as this bed will become part of the rotation. Next season, we will only need maybe 1/4-1/3 of the straw and manure and can use potatoes from this crop as seed tubers for the next (providing no diseases strike the patch). Next year, we could only be looking at ~$50 on materials for $90-110 worth of spuds. We're also not going to get varieties like the Royal Blue or Cranberry Red at the local fruit & veg. In terms of time, the whole exercise took the two of us from around 10am to 3pm (with an hour break in the middle for lunch). The absence of digging meant that than heaviest labour was really moving the bags of manure and strewing them over the bed.